UPDATE: The organizer did not receive enough registrations and has cancelled the workshop in Shoreline. 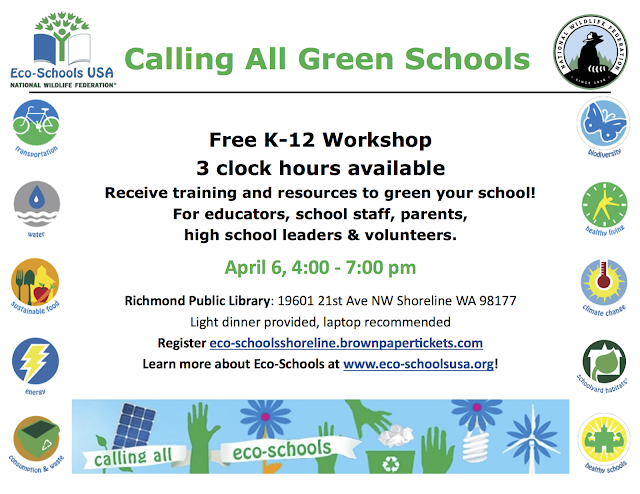 Free K-12 workshop - receive training and resources to green your school. Thursday, April 6 from 4-7pm at the Richmond Beach Public Library, 19601 21st Ave NW, Shoreline 98177. Register here and learn more here. Sponsored by the National Wildlife Federation.